James R: It's a week that (once again) is dominated by Image Comics and my favourite working creator - Jeff Lemire. 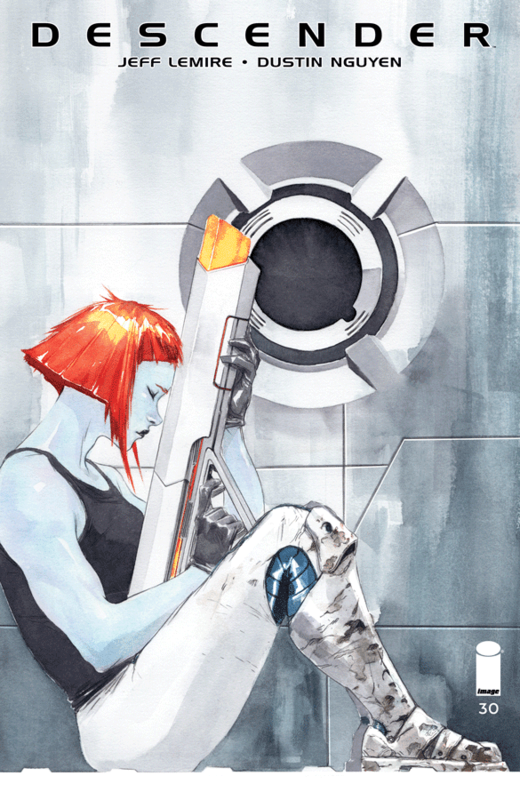 The publisher releases the next instalments of Royal City and Descender, the SF epic crafted with Dustin Nguyen. The latter is now moving towards an endgame, and it's held my attention for the entire run - I think this is is a title that people will discover when it has concluded and collected; like my beloved Star Wars, it's a series epic in scope but with a lot of heart. Speaking of series coming to an end, this week also sees Image release the penultimate issue of Kill Or Be Killed, a book that has twisted in unexpected ways throughout and been another win for Brubaker, Phillips and Breitweiser. It's also the final chapter of Barrier, and Vaughan and Martin's alien abduction tale has been one of the great surprises of the year. I've loved having the issues on a weekly basis (something that can be tricky to get right). Last but no means least from Image is the latest issue of Lazarus - the first issue back from the hiatus reminded us just how good this book is, and as always, I can't wait to see what Rucka and Lark produce. The other big release of the week is Grass Kings from BOOM! Studios. Matt Kindt and Tyler Jenkins' thriller has the weight and calibre of an HBO series, and as with Descender, it's a book that I'll encourage people to pick up in trade once it's wrapped up. From DC there's Man Of Steel #1, Brian Michael Bendis' much-heralded arrival in the DCU that has been definitely blunted by two underwhelming previews: surrounded by some simply magical stuff in Action Comics #1000, his contribution was pretty pedestrian, and the pages in the DC Nation #0 sampler didn't scream 'DO NOT MISS THIS!' That said, it would be remiss of me to not give the full issue a try - here's hoping the final product has been better than the trailers. Over at Marvel, I'm dipping back into the Star Wars books as there's a Lando miniseries! Lando: Double Or Nothing focuses on Lando prior to his appearance in Solo (which is GREAT, by the way) so given my love of Donald Glover's portrayal in the film, I hope this series from Rodney Barnes and Paolo Villanelli catches some of that magic. Andy H: It's finally here: Brian Bendis gets to grips with Superman in Man Of Steel #1. To be honest, the Bendis Superman bits that have been out so far have been a bit underwhelming but that hasn't diminished my interest or anticipation for this miniseries. Bendis brought new life to the Avengers, many years ago, when their star was in decline. Here though, Supes has been flying high since 'Rebirth' so it will be interesting to see how this will shake up the recent status quo. It's a weekly miniseries which should keep things at a fair pace. Another biggie (quite literally) is the 80 page Amazing Spider-Man #800. Dan Slott is joined by a host of his previous artistic collaborators including Stuart Immonen, Humberto Ramos, Giuseppe Camuncoli and Jim Cheung. This has been a great swansong for Slott and, as the title suggests, he really is going to 'Go Down Swinging'. Totally out of the blue for me have been the BOOM! Studios Kong series. These have really grabbed me, thanks in the most part to the art of Carlos Magno. Don't get me wrong, the stories have been great too, but the art has been magnificent. Kong Of Skull Island: 2018 Special looks like another cracker. Viking long ships wash ashore on Skull Island; how will these Norsemen (and women) survive Kong and the island's many monsters? Finally an en masse DC selection: Aquaman meets Jabberjaw, Black Lightning meets Hong Kong Phooey, Flash meets Speed Buggy and Super Sons meet Dynomutt. With four titles in one week, DC aren't making it easy, but these one-shots do look like a lot of fun.